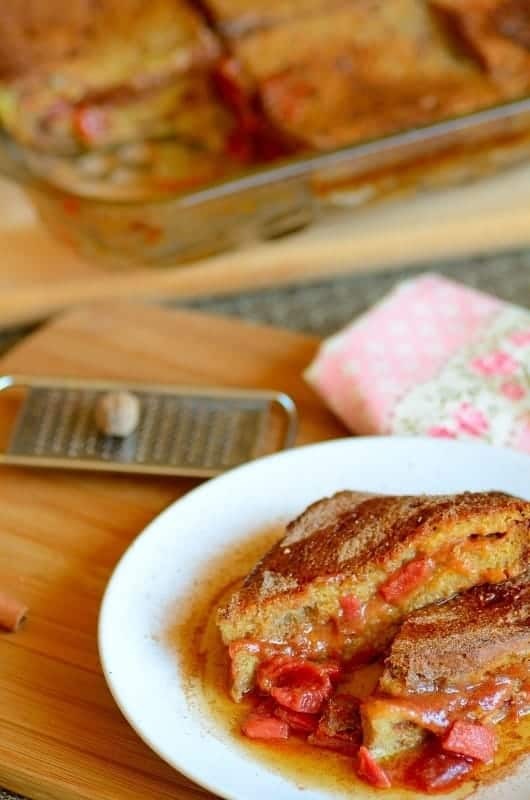 Romeo and Juliet French Toast Casserole is an overnight, oven baked french toast stuffed with guava paste and cream cheese that can be served for either breakfast or as a dessert. French toast is not so French in Brazil. Huh? For us it is actually a heritage passed down from our Portuguese settlers. The traditional recipe simply calls for slightly stale bread dipped into milk and then into whisked eggs, and afterwards pan-fried in oil. It is usually served sprinkled with cinnamon and sugar. It is still a dish very much enjoyed at Christmastime, but is so delicious that we serve it all year long — especially for breakfast. This version, however, differs from the traditional one, although a few similarities — in terms of ingredients rather than the process– were kept. This is a more modern version, which is more convenient and less messy because instead of pan-frying, this is baked. You read that right: Romeo & Juliet! OK, I am not crazy nor under the influence… 🙂 In my beloved country, Romeo & Juliet (Romeo e Julieta) is more than characters from Shakespeare’s drama. It is also a term to describe the perfect combination of cheese and guava… For us, like the characters in the play, they were made for each other, although unlike the classic love story, this ending is quite a happy one. If you have any doubt, make it and give it a bite. I can already foresee the ending: you will fall in love too with this Romeo and Juliet Stuffed French Toast Casserole. Now if you excuse me, a plate of happiness awaits for me. Enjoy our Romeo and Juliet Stuffed French Toast Casserole! 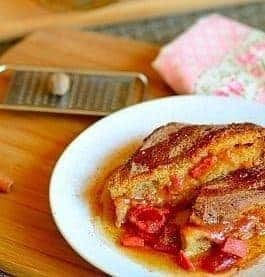 Romeo and Juliet French Toast Casserole is an overnight, oven baked french toast stuffed with guava paste and cream cheese. *These ingredients can be found both at Latin markets and online. In a small pot, mix the guava paste with the water and bring to a boil over medium-high heat. Reduce heat to medium and let cook for approximately 5 minutes, stirring occasionally. The paste will be partially melted. Remove from heat and stir in the lemon juice. Let cool. In a electric mixer, whip the cream cheese or mascarpone a bit at low speed. Add the partially melted guava paste and beat until well combined. Add the guava shells and mix well by hand. Reserve. Grease with butter or non-stick butter flavor cooking spray a 9 × 13 inch (about 33 x 23 cm) glass baking dish. Layer 6 bread slices. Cover with the whipped softened cream cheese/marcarpone-guava mixture. Cover with remaining bread, pressing down gently to seal the edges. In a separate bowl, beat the eggs, milk, coconut milk, condensed milk, spices, salt, and vanilla extract until well blended, and pour on top of the bread. Cover and refrigerate overnight or at least for 4 hours. Preheat oven at 375 º F (190º C) and bake the Romeo and Juliet French Toast Casserole for 45-50 minutes or until set. Serve Romeo and Juliet French Toast Casserole warm with honey or sprinkle either a mixture of cinnamon-sugar or powdered sugar on top. Enjoy! Absolutely love calling that Brazilians call cheese and guava Romeo & Juliet! The toast looks amazing too! Thanks so much, Sofia! In Brazil, the simplest way to taste Romeo & Juliet is plating a slice of cheese with one of guava paste… So comforting!!! It is like a peanut-butter and jelly sandwich here. In Cuba guava is a big thing and we to pair it with cheese. This looks absolutely scrumptious, can not wait to make this. I’m sure I’m going to love it. 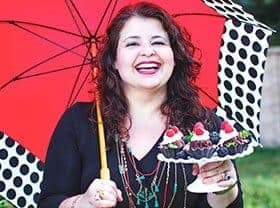 Nory: I hope you make it and enjoy! It is one of my fave French toast recipes. Thank you for stopping by and have a Happy V-day!